The Massachusetts Legislature is currently debating a bill (S.1220) that would make it the 17th state in the nation to allow public facilities (including restaurants, sports arenas, theme parks, etc.) to carry “stock” epinephrine, if they so desire. Importantly, use of this epinephrine would involve Good Samaritan protection. 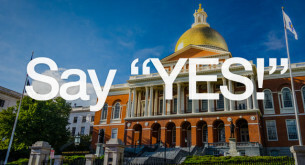 AllergyEats Founder, Paul Antico, is very much in favor of allowing businesses the option to carry stock epinephrine and testified in front of the State Legislature this past Thursday, September 16. Senator Lewis, Representative Hogan and members of the Joint Committee on Public Health – I’d like to thank you for considering this bill that would allow epinephrine auto-injectors in public entities and I’d like to thank Senator Spilka for sponsoring this legislation. My name is Paul Antico. I live in Cohasset and have 5 children, three of whom have food allergies, so as you can imagine this legislation is extremely important to me. My wife and I live everyday vigilantly protecting our children and teaching them the tremendous importance of avoiding their food allergens. If we or they fail, the result may be anaphylaxis – an unpredictable, life-threatening allergic reaction with rapid-onset symptoms that can eventually lead to death. But it’s not just for my family that I’m here testifying. As the Founder and CEO of AllergyEats, and a board member of the Asthma & Allergy Foundation of America amongst other groups, I’m advocating on behalf of the millions of children and adults who are allergic to certain foods (as well as insect stings) and who can experience anaphylaxis if exposed. I’m also advocating on behalf of those who don’t yet know they have a severe allergy, and won’t until they are in anaphylaxis and being rushed to a hospital – both undiagnosed children as well as adults experiencing sudden anaphylaxis for the first time after years with no food issues. The fact is that food allergies are growing at exponential rates in the U.S. Currently, an estimated one in 25 Americans – including one in 13 children – lives their life with one or more food allergies. If you extrapolate that, it equates to roughly 270 thousand Massachusetts residents, over 100 thousand of whom are our children. We don’t yet know why there’s been an acceleration in the number of people developing food allergies or why teens and adults can suddenly become allergic to a food they’ve always eaten. Answers, unfortunately, do not seem to be on the near-term horizon. We do know, however, that epinephrine is the first line of defense that can reverse an anaphylactic reaction. It is literally a life-saver – able to bring bodily systems under control when used right away, and a very benign medicine as well. For families like ours, being vigilant about carrying epinephrine auto-injectors is critical. But even we can forget. It doesn’t happen often, but it does happen. And it’s frightening when it does. While those who know they suffer from food allergies have the ability to protect themselves to an extent, by carrying epinephrine with them, there are also many people who will eat something at a restaurant in the next few days, weeks, months and years and find out suddenly and dangerously that they have a food allergy. It can happen at a restaurant, at Fenway Park, at the Franklin Park Zoo, at Six Flags New England, or even at church services. If public facilities are allowed to carry epinephrine auto-injectors, these people can benefit instantly – and possibly have their lives saved. This extra layer of protection is easy to fulfill, without creating an undue burden on any participating facility. Massachusetts, long a leader in the healthcare industry, should do what 16 other states have done – 13 this year alone – and that’s pass legislation allowing epinephrine to be stocked and maintained at public locations. Our public schools already carry epinephrine auto-injectors and in 2010 Massachusetts became the first state in the nation to pass a law surrounding the education of our food service industry regarding food allergies. Now we should step up and add another layer of protection. I urge you to pass S. 1220. It can save lives. Paul Antico is the CEO and Founder of AllergyEats, the leading guide to finding allergy-friendly restaurants. He is the father of five children – three of whom have food allergies. As a passionate food allergy advocate, he serves on the Board of Directors for the Asthma and Allergy Foundation of America (AAFA), both nationally and for the New England chapter, the Massachusetts Department of Public Health Food Allergy Working Group, the Institute of Medicine’s (IOM’s) Advisory Panel for the Consensus Study on Food Allergies, and the National Peanut Board Food Allergy Education Advisory Council. His company also hosts the annual AllergyEats Food Allergy Conference for Restaurateurs and Food Service Professionals – the only industry event of its kind – featuring best-in-class experts, valuable tips and actionable advice to become more allergy-friendly. I thank you for even considering such a law. I an a 45 year old women who has food allergies that are extreme. It should also be a law where in the work place a person like myself can feel safe. I work for the city of New York. I have no safe place to eat if I wish to eat at work. Mico waves are out of the question. I have been told that’s it my problem so deal with it. I want to know what can I do…people feel it’s a matter that’s in my head and try all the time and test me. I have been sent to the hospital on several occasions for this matter. What right do I have to be safe. Hi – I contacted my local reps, Jason Lewis and Michael Day regarding this legislation. Can you update me on how far it has gotten? Thanks so much! The latest news I know of was the testimony we gave described in this blog post. We’ll do our best to keep everyone updated.